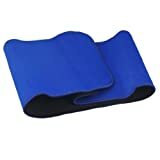 TOOGOO(R) Blue Adjustable Waist Support Elastic Pain Back Brace. Please check your waist girth before ordering to make sure the waist support perfectly fit. Provides support to your wrist. Good compression can make your waist covered completely. A good choice for moderate levels of back pain. Also provides warmth, comfort and flexibility for daily wear. Detachable support for convenient to use and fit most waist.